Somewhere it was written that "admin" "passwd". Hello, the default admin username and password are these, mentioned by you. Do you have write access to the SQL database? If so, try to overwrite the password field and try again. The relevant table is "users" (could be dotp_users), the field is "user_password" and it should be MD5 hashed. I have already tried several options. In MySql, in the table "dotp_users" I put my data. I do not remember which login and password I entered when I installed "dotproject". But I do not remember exactly. How can I recover my login and password? 5F4DCC3B5AA765D61D8327DEB882CF99 Here is an md5 hash that represents the word "password" (without the quotes, of course). Put it there, login and change. On Fri, Apr 27, 2018 at 7:44 PM, it19862 ***@***. ***> wrote: @teodorg <https://github.com/teodorg> I have already tried several options. In MySql, in the table "dotp_users" I put my data. Does not work... I do not remember which login and password I entered when I installed "dotproject". In MySQL, the original login and password was login = "admin" pass = "76a2173be6393254e72ffa4d6df1030a" But I do not remember exactly. How can I recover my login and password? I have full access. [image: 3170] <https://user-images.githubusercontent.com/18245828/39374332-3b92c8be-4a53-11e8-9f39-659443feeb15.jpg> — You are receiving this because you were mentioned. Reply to this email directly, view it on GitHub <#13 (comment)>, or mute the thread <https://github.com/notifications/unsubscribe-auth/AK8il2DtdoUYUSJWkp6jT8VWNf4Esacdks5ts0r9gaJpZM4TP3R3> . Ouf, contact me on private, if you want. I will login and solve it for you. I need to contact you by email? Sorry, but I did not understand what your message means. Could you write more in detail what is required of me to get help from you. I have a similar problem but I am definitely sure that username and password are correct. After complete install of dotproject, I reach the login view, type in the default username "admin" and "passwd" but login seems to fail. After clicking on "Login" the application shows the login page again without any information if anything went wrong. I looked at the user table and checked the md5 encoded default password "passwd". The password matches the encoded String "passwd" so it seems to be correct. Does anybody know why login fails despite valid login information? Ok, it seems that there is obviously something wrong with the installation. Could you contact me on private and provide me with access, so I can dig to the bottom of this? On Wed, Sep 5, 2018 at 3:55 PM André Barthel ***@***. 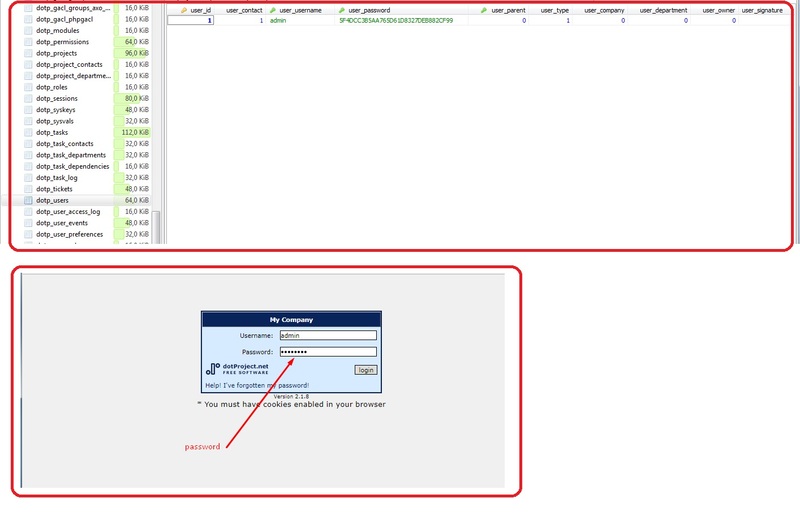 ***> wrote: I have a similar problem but I am definitely sure that username and password are correct. After complete install of dotproject, I reach the login view, type in the default username "admin" and "passwd" but login seems to fail. After clicking on "Login" the application shows the login page again without any information if anything went wrong. I looked at the user table and checked the md5 encoded default password "passwd". The password matches the encoded String "passwd" so it seems to be correct. Does anybody know why login fails despite valid login information? — You are receiving this because you were mentioned. Reply to this email directly, view it on GitHub <#13 (comment)>, or mute the thread <https://github.com/notifications/unsubscribe-auth/AK8il_37ALMjoUQNvNh6aC7ckbsNF4s3ks5uX8nEgaJpZM4TP3R3> . What do you mean with provide me with access? You mean some remote sesssion? I can provide you my system information. Trying to install "dotproject" on XAMPP 3.3.2 with MySql, Apache 2.4.29, Tomcat 7.0.56 and PHP Version 7.1.12. There are no dotproject mods installed. Guys, I played several times with 2.1.9. The install procedure goes smoothly and I login in without any troubles. Platform: Linux, Centos 6 and 7 , Apache 2.2, MySQL 5.1, PHP 5.3. If someone needs a helping hand in installing - just do let me know. I would gladly do it in 10min for you. I see, my system is running PHP 5.6 and MySQL 5.5, this can be an issue? It should also work with PHP 5.6 and MySQL 5.5. It will work with Apache and also with Nginx using php-fpm. If you get into trouble with the login look for any errors in your system log files, and report them here. Also read above for how to check the database. There's something wrong when updating an existing installation. I was coming from 2.1.6 and no user could get in. I could see that the user roles were gone, so all users were set Inactive. In order to make them active you need to assign them a role. Apart from that, I also lost some other information like cost code. I can't be sure if there's something else, too. I had to revert back to 2.1.6 and restore user roles. I wanted to try 2.1.9 to see which improvements it has, but I can't. That's a shame. I would suggest that you suppress the anger inside you and see how we can dig into that problem and solve it together? Dear @teodorg, I was trying to give some insight. I'm no programmer, so I'm sorry for giving limited information. But there was no anger in my words, only the aim to provide some info. I'm so grateful to the developers. That would make it a lot easier to provide assistance. A clean install creating a new DB. Had some problems creating the DB. Then I tried and upgrade by duplicating the current installation folder and updating the files over it. Again, had problems managing the DB, it wouldn't connect to it. I could manage to upgrade the duplicated folder and I got in with admin user. That's the moment when user roles were gone. I'm not that sure about it. Can you try to get into mySQL and check the admin's status? If it's "inactive", then it can be all related. @lgarmendia76 it is not the same issue - the oiriginal issue was about login and password for a new installation - your issue is about updating an existing installation - and has nothing to do with login and password - please don't hijack other threads. By default the admin user is admin with a password of passwd . If you didn't see any errors on the database build page then it should work. If it doesn't, and doesn't show an error on the login page then check your web server error log for clues.